Top-of-the-range XDCAM HD camcorder recording HD material at up to 50Mb/s onto Dual Layer Disc - Three 2/3-inch CCD sensors, Full 1920 x 1080 4:2:2 operation and 1080/720 switchable. The Sony PDW-700 captures stunning HD images. It features three newly developed 2/3-inch progressive Power HAD FX CCDs at 1920 x 1080 resolution. 14-bit A/D conversion and advanced digital signal processing are also used to ensure the highest picture quality. 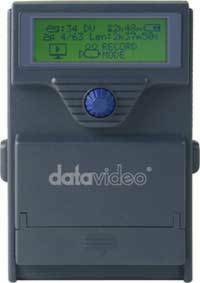 The Sony PDW-700 records at a data rate of up to 50Mb/s using an MPEG-2 4:2:2P@HL compression technology called MPEG HD422. The camcorder features multi-format recording at 1080/50i, 1080/59.94i, 1080/25P, 1080/29.97P*, 720/50P* and 720/59.94P*. It also supports record and playback of XDCAM HD* (4:2:0) at 35Mb/s, 25Mb/s and 18Mb/s**, and XDCAM standard definition MPEG IMX and DVCAM material***. With fast file-based operation and outstanding picture quality, the XDCAM HD422 line-up has widened the appeal of XDCAM for applications such TV drama, documentaries and general entertainment programs, and for ENG where speed of operation is a critical requirement. * 1080/29.97P, 720/50P, 720/59.94P and XDCAM HD (4:2:0) operation requires V1.2 firmware. ** Operation in MPEG HD at 18Mb/s is replay only. *** SD operation requires CBKZ-MD01 option. In the Sony XDCAM series of products, recordings are made as data files in the industry-standard MXF (Material eXchange Format) file format. This allows material to be handled with great flexibility in an IT-based environment - easily available for copying, transferring, sharing and archiving. All these operations are accomplished without the need for a digitizing process. File-based data copying allows for degradation-free dubbing of AV content, which can be performed easily on a PC. The file-based recording system also allows for material to be viewed directly on a PC, simply by linking it to the XDCAM unit via an i.LINK connection. This works in just the same way as a PC reading files on an external drive. The PDW-700 XDCAM HD422 camcorder comes equipped with IT-friendly, computer-based interfaces. These include an i.LINK interface supporting File Access Mode as standard, and an Ethernet interface. XDCAM HD422 products use the same platform as the XDCAM products in wide use around the world. They share the advantage of no mechanical contact between the equipment and the recording media, achieving both a high level of durability and a long media life. XDCAM HD422 products also offer the same high resistance to shock and vibration as other XDCAM products. The XDCAM HD products use a large-capacity nonlinear optical disc for recording, called Professional Disc, which Sony has developed specifically for professional recording applications. The PFD50DLA and PFD23A are 12cm, reusable optical discs. The PFD50DLA is a Dual Layer disc with a capacity of 50 GB, while the PFD23A is a Single Layer, 23 GB disc. The large capacity of the PFD50DLA makes it possible to record up to approximately 95 minutes of high-quality MPEG HD422 material. The Professional Disc is extremely reliable and durable because it experiences no mechanical contact during recording or playback, and is packaged into an extremely durable and dust-resistant disc cartridge. Non-contact recording and playback also makes it an ideal medium for long-term storage of AV assets. Whereas traditional tape archive systems must be rewound on a periodic basis to remove magnetic powder debris, the Professional Disc completely eliminates this process. Its reliability has already been demonstrated by the huge number of XDCAM products deployed worldwide since 2003. At the same time as recording the high-resolution video and audio data, XDCAM products also record a low-resolution version of this AV data on the same disc. Called "Proxy Data", this is much smaller in size than the high-resolution data (1.5 Mb/s for video and 0.5 Mb/s for audio). Because of its lower resolution, Proxy Data can be transferred to a standard PC at a high speed, and browsed and edited using the PDZ-1 Proxy Browsing Software (or other compatible editing software offered by industry-leading manufacturers). With the PDZ-1 software, it can be converted to the popular ASF format for playback on Windows™ Media Player, providing dramatic improvements in production workflows. Proxy Data can also be viewed directly on a PC without data transfer using an i.LINK (File Access Mode) connection, and can even be sent over a standard Ethernet network. The overall flexibility of Proxy Data means that it can be used for a variety of applications, such as immediate logging on location, off-line editing, daily rushes of shooting on location, client approvals, and more. All XDCAM HD422 products are capable of recording a variety of metadata, which provides a huge advantage when searching for specific data after an initial recording has been made. Information such as production dates, creator names and camera setup parameters can be saved, together with the AV material, on the same disc using the supplied PDZ-1 software. This makes it possible to organize and search through all recordings effectively. One particular metadata, called EssenceMark™ (Shot Mark), is a convenient reference that can be added to desired frames to make them easy to recall in subsequent editing processes. Clipflag* is another convenient metadata which users can add to their desired clips as "OK", "NG" or "Keep". The Sony PDW-700 is equipped with three 2/3-inch-type 2.2-megapixel full HD progressive CCDs, which are also used in the well-proven HDC-1500 HD Camera from Sony. Based on Sony's Power HAD FX sensor technology and the latest on-chip lens structure, this type of CCD offers a high sensitivity of F11 at 59.94 Hz (F12 at 50 Hz) and an excellent signal-to-noise ratio of 59 dB in Noise Suppression (NS) mode, which helps to reduce the high-frequency noise elements of video signals using Sony's advanced digital processing technology. The Sony PDW-700 offers a wide choice of video formats for both frame rates and scanning mode. They include 59.94i, 50i, 29.97P, and 25P in a resolution of 1920 x 1080, and 59.94P and 50P in 1280 x 720. A recording and playback capability in 23.98P is also available using optional software*. One of the big appeals of the PDW-700 is its highly flexible multi-format recording capability. Users can select a recording format from HD (MPEG HD422 and MPEG HD) and SD (MPEG IMX* and DVCAM*), in a variety of frame frequencies (as shown in the table on page 4). The Sony PDW-700 incorporates a high-performance 14-bit A/D converter that enables images captured by the high-performance CCDs to be processed with maximum precision. In particular, this high-resolution A/D conversion allows the gradation in mid-to-dark-tone areas of the picture to be faithfully reproduced. Thanks to the 14-bit A/D converter, pre-knee signal compression in highlighted areas can be eliminated, and the camera can clearly reproduce a high-luminance subject at a 600% dynamic range. The newly developed DSP (Digital Signal Processing) LSI is the heart of the image-processing device for the PDW-700 camcorder. In conjunction with the 14-bit A/D converter, it reproduces images captured by the CCD at maximum quality. In addition, white balance, white shading, and flare are digitally corrected, allowing for stable image correction. What's more, the PDW-700 provides a NS (Noise Suppression) mode to reduce high-frequency noise elements in a video signal using Sony's advanced digital processing technology. The Sony PDW-700 records uncompressed four-channel, 24-bit audio. It is also equipped with a range of audio interfaces. The Sony PDW-700 is designed to be very compact and ergonomically well balanced, providing a high level of mobility and comfort in various shooting situations. It weighs only 6.0 kg (13 lb 4 oz) including the HDVF-20A viewfinder, the ECM-680S microphone, the PFD50DLA disc and the BP-GL95 battery pack. To minimize errors caused by shock or dust entering the disc drive, the Sony PDW-700 has several unique ways of providing operational resistance to such factors. The disc drive entrance is concealed by two lids, helping to prevent any dust from entering the drive. In addition, four rubber dampers are used to hold the disc drive block in place and to absorb shocks that would otherwise go into the disc drive. Two types of optional viewfinders are available for users: the HDVF-20A and HDVF-200 2.0-inch** monochrome viewfinders and the HDVF-C35W 3.5-inch** colour viewfinder. The Sony PDW-700 is compatible with a variety of microphones. Three shotgun-type microphones, ECM-680S/678/674, are available as options. Moreover, it is equipped with a slot to accommodate the DWR-S01D** digital wireless microphone receiver, which provides two-channel audio with stable and secure transmission tolerant to interference waves. The WRR-855 Series microphone receiver can also be used within this slot. *No microphone is supplied with the PDW-700. **The digital wireless microphone system is not available in some countries where prohibited by radio law. A large, easy-to-view, colour LCD screen on the PDW-700 camcorder's side panel enables operators to instantly review recorded footage, as well as access the camera's set-up menus and view status indications such as four-channel audio meters, and the remaining time available on the disc and battery. It also enables advanced operations such as Thumbnail Search and Scene Selection. The shutter speed of the PDW-700 is selectable down to a 16-frame period (in 2-, 3-, 4-, 5-, 6-, 7-, 8- and 16-frame periods). During such a long frame period, electrical charges accumulate on the CCDs which dramatically increase sensitivity. This helps camera operators to shoot in extremely dark environments. The Slow Shutter function also allows operators to use shutter speeds longer than the frame rate, and to intentionally blur images when shooting a moving object, for increased shooting creativity. *Only the even numbers of frame settings are available in 720 mode. The Sony PDW-700 offers an Interval Recording function which intermittently records signals at pre-determined intervals. This is convenient for shooting over long periods of time, and also when creating pictures with special effects of extremely quick motion. *Requires a software upgrade available in autumn 2008. The Sony PDW-700 offers a Picture Cache Recording function that is especially useful during ENG applications. Up to 30 seconds of audio and video signals are buffered into the camcorder's memory before the Rec start button is even pressed (when in Standby mode). This means that everything that happened 30 seconds before the Rec start button was pressed will still be recorded onto the disc. What's more, this function works even before the disc is inserted in the drive - thereby helping to prevent the loss of any unexpected, yet important events. The caching period can be adjusted by menu setting. This camcorder cache memory also allows users to exchange the discs while recording. By removing a disc from the drive and inserting a new disc within 30 seconds, video, audio, and time code can be recorded seamlessly onto the new disc. The Sony PDW-700 camcorder has a Live & Play function that can simultaneously output both playback signals (images already recorded) and incoming camera signals (images seen through the viewfinder). Both signals are fed to their respective output and viewfinder connectors independently, and can be viewed at the same time. This allows users to frame the next shot, adjust the exposure, and even focus the lens while the camcorder is playing back recordings from the disc. The Sony PDW-700 with the HDCA-702* MPEG TS Adaptor provides a MPEG Transport Stream output capability via a DVB-ASI connector. The HDCA-702 encodes signals to MPEG TS and output via its DVB-ASI connector, concurrently with the PDW-700 recording onto disc. The bit rate is selectable from 17.5 Mb/s to 43 Mb/s, which is suitable for material transmissions using microwave and satellite modulators. *Planned to be available in summer 2008. A wide choice of gain and its easy-to-use control system is one remarkable feature of the PDW-700 camcorder. By setting the gain to the assignable switches, the user can easily access the desired gain. And the transition to each gain value is extremely smooth thus eliminating undesirable abrupt changes to the overall image. The Sony PDW-700 camcorder comes equipped with optical ND (Neutral Density) filters and electrical CC (Colour Correction) filters. The optical ND filter is controlled via a built-in ND filter wheel -- Clear, 1/4ND, 1/16ND/, and 1/64ND. And with the electrical CC filter, the user can easily obtain the desired colour temperature by setting the mode - 3200K/4300K/5600K/6300K - on a camcorder-assignable switch. The user can select the four values cyclically or choose one preset value. Another usage of the CC filter function is the colour temperature setting which can be instantly set to the required level with an absolute value 3200K, 4300K, 5600K, or 6300K. This is also available via an assignable switch. This is useful when a sudden change happens in the shooting environment and a quick and direct setting is required. The Sony Digital Extender function of the PDW-700 enables images to be digitally doubled in size. Unlike lens extenders, the Digital Extender function performs this capability without any loss of image sensitivity, which is often referred to as the F-drop phenomenon. *Use of the Digital Extender function reduces image resolution by half. Requires a software upgrade planned to be available in autumn 2008. At the touch of a button, the center of the screen on the viewfinder of the PDW-700 camcorder can be magnified to about twice the size, making it easier to confirm focus settings during manual focusing. *Requires a software upgrade planned to be available in autumn 2008. For pool-feed operations, the optional CBK-HD01* and CBK-SC02* boards provide HD- and SD-SDI inputs, and SD composite input respectively. *Planned to be available in autumn 2008. 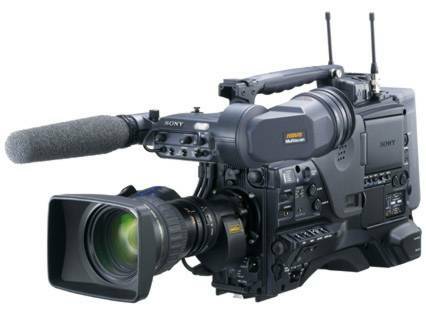 The Sony PDW-700 camcorder has the Trigger REC function that enables synchronized recording with PDW-HD1500 and PDW-F75 XDCAM decks or HDCAM™ portable decks connected via the HD-SDI interface - a convenient feature for backup recording. "Mini-jack (x2); front: monaural, rear: stereo/monaural"